behind mommy lines: Hit The Switch! I know my Mom thinks I take this "no annoying toy" rule too far. And sure, we may as well just be Amish, but that is besides the point. All the toys in my house are either simple toys made of wood, don't make noises in general, or at least have an OFF BUTTON. That's one of the first criterion a toy must pass when I am in the aisle assessing a toy for purchase and introduction in our home: existence of an off button. I will practically dig around like a maniac in the packaging until I am assured there is, in fact, and off switch. And if it has one, I'll think about getting it for my brood. I'm not a total buzz kill! We own a few toys that make sounds or sing songs. (they're the bane of my very existence, but I allow them because these are the toys that usually give me the most time to sneak away and do a couple loads of laundry) However! They can all be turned off! All of them! I've learned this lesson the hard way. 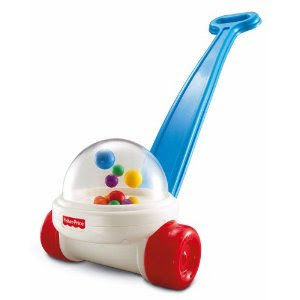 In the early days of my parenthood experience, I fell in love with a bubble ball push toy. Oh the nostalgia! I'm pretty sure most everyone played with one of these little gems as a child. How could I deprive my children of such a childhood? I later regretted this decision mightily. That Bang! Pop! Whirr! sound haunted my dreams. Even when the kids were napping and there was quiet throughout our house, I was convinced the sound still resonated and echoed through the walls. Just to mess with me. Disney! You really know how to make speakers that really project Mickey's high pitched tone and jaunty xylophone music clear to the ends of the earth! I'm sorry, residents of Siberia, I'm sure Little Man will grow out of it... at some point. I've received your letters pleading for the music to stop, I sympathize with you, but there is nothing that can be done. While I'm not exactly sure why Disney chose to employ this technology with ride-on toys made specifically for small children, they are some powerful speakers you've got there, Disney. Congratulations. 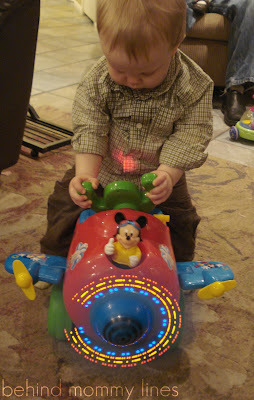 What I am particularly frustrated with is the fact that there is NO OFF SWITCH of any kind on the ride-on plane toy. I can't turn the music off! I cannot stop Mickey from roaring "Hey there, PAL! Flying sure does remind me of a SONG!" The controls are so sensitive even, the dogs have triggered this little plane- just by walking near it. WHY NO OFF BUTTON, DISNEY?! WHY?! DO YOU HATE ME, DISNEY? DO YOU?! So by now you're probably thinking, "Dude! Whiny McWhinerstein! Take the death plane back to Grandma's house!" My quandary is this: 1) Little Man loves the thing, 2) If I can suffer through the nails-on-chalkboard-bedlam, it does occupy the children, and 3) would it be any better at Grandma's? Do you think I could pull off a black ops stealth operation, code name: "battery-ectomy" on this toy? Sometimes these operations go well, and other times the kids catch on and start demanding some Duracells. That's what I do too. Clear packing tape makes all the difference in the world!! I have it on everything because I too have a mother that buys only noise. If one were to develop a on/off switch for toys that easy to use and kids safe, Would you be willing to provide your comments on the following please. - What pain points do you have related to "off switch less toys" ? - Would you be willing to use a on/off switch thats kids safe & easy to install ? - what feature would you like to see in that? - What features you dont like to see in that? - What price would you be willing to buy each unit?